This week is a wonderful time to begin my involvement – Cristina Ferrare from www.oprah.com/own will be joining #SundaySuper. Five of the participating bloggers were selected to receive a signed copy of her cookbook, A Big Bowl of Love and all recipes for this week have been selected from her cookbook or her website. Since I don’t have her cookbook (but I can’t wait to be back in the States to check it out!) I immediately headed to her website, which is filled with great, easy recipes. At first glance her pesto recipe seems like a standard pesto: basil, olive oil, pine nuts, and parmesan. But as I took a closer look, I realized that it was actually quite a new take on this traditional pasta sauce. In addition to basil, there’s also parsley. And whereas most pesto recipes blend everything together, Cristina just whizzes together the basil, parsley, garlic, and olive oil, then tosses that with cooked pasta, parmesan, and whole toasted pine nuts. I loved it! I love the added texture that the whole pine nuts add, and the effect is almost like a deconstructed pesto. This isn't your usual pesto recipe, and the whole toasted pine nuts provide a wonderful added flavor and texture to this traditional dish. You can puree the herbs and olive oil a few days ahead of time. Slowly add the olive oil until blended. Put the pine nuts in a small, dry frying pan and toast over medium heat until they start to release their oil, around 5 minutes. Shake the pan back and forth to keep from burning. Set aside. Add the pesto and mix well. Add ¼ cup of the reserved pasta water. Mix in the grated Parmesan and toasted pine nuts. Our recipes will be perfectly paired with wine chosen by Wine Every Day. I love the spirit of the #SundaySupper team! Great to have you cook with us this week! This would make me very happy for Sunday Supper ! I’m so delighted you’ve joined us, Katherine! I love, love pesto, and Cristina’s recipe sounds fantastic!!! Love how easy this is! Delicious! Beautiful pasta! Thank you for joining in #SundaySupper and sharing this recipe. I love pesto and it never fails to make my taste buds happy! great pasta dish! A simple yet mouthwatering pasta! I’m in love with pesto, and your photos make me want to dive right in! Deconstructed pesto is brilliant! Love this idea for a delicious #SundaySupper. Pesto is such a simple, but still sophisticated way to make pasta. LOVE the way you plated it! Sunday Suppers sounds like a great movement! Deconstructed pesto… great idea! ‘Love pesto and this one looks great! I am so glad you share our mission to bring back Sunday Supper Around the Family Table in every home…Love this recipe and can’t wait to try it! So easy but sounds so flavourful..yum. You did choose a great pasta to use for the pesto, it really clings to all those crevices! No doubt this would be perfect for a picnic or afternoon brunch. Also, glad you are enjoying the Sunday supper-thanks for posting this tasty one! I would definitely make this dish it looks delicious, but use Al Dente® Pasta, because it’s fresh, light, and tastes like homemade. It cooks in just 3 min. I would use either their whole wheat pasta, or Carba-Nada pasta that is low carb. Nice new group! 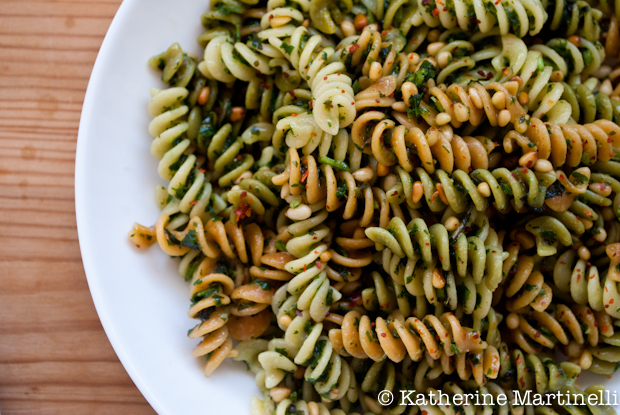 And I like the pesto variation – makes so much sense to toss the pesto base with the pasta, Parmesan, and pine nuts. And you’ve chosen a great pasta to showcase this dish – pesto pasta often photographs with kind of a dull color, but your colorful pasta solves that. Good post – thanks. We LOVE having supper together late afternoon on Sundays. Everyone in my family looks forward to what I am going to cook and we usually try out something new. This is one of my favorite times with my family. I’ll have fun watching your group! Sounds like a delicious take on a pasta salad Katherine! oh my gosh! I wish I had a huge bowl of this right now! 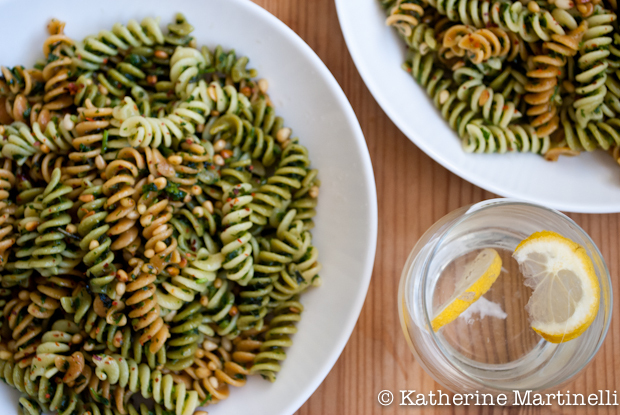 i love the idea of toasting the pine nuts and keeping them whole – beautiful pasta dish! 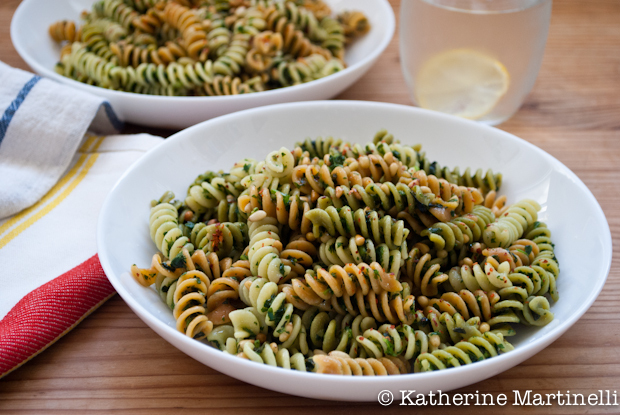 Love pesto and pasta, the ultimate easy summer meal. Great post! Looks like a great Sunday supper Katherine! I could go for a big bowl right now! This just looks super yummy Katherine. I just keep staring at it. I love pesto and I like the fact that Cristina didn’t blitz the pine nuts along with the rest of the ingredients…adds more texture and crunch to the dish 🙂 I’m going to try it this way next time. Nothing beats than good bowl of pasta..and yours look so good! Great recipe and wonderful photos! Pesto is such a classic and loved sauce for pasta! You can’t go wrong with that flavor! What a great new take on pesto, Katherine … By the way, you have been nominated for my NEW Food Stories Award for Excellence in Storytelling. Check out my site for the details (foodstoriesblog dot com). Looks like a great pasta for Sunday Supper Love it! Your pesto looks delish! My son is into penso these days. I should make pesto pasta for tomorrow lunch! That recipe looks SO good. I can’t wait to try it!